In September, I took a class on Culinary Science and working with Tapioca Maltodextrin. With this method, you can take items with a high fat ratio and turn it into powder. You can learn more about my class and this technique by clicking here. When Susan from The Wimpy Vegetarian announced this weeks #SundaySupper theme: Gifts from the Kitchen, the first thing that came to mind was Nutella Powder. This is a unique gift that is easy and cheap to make. 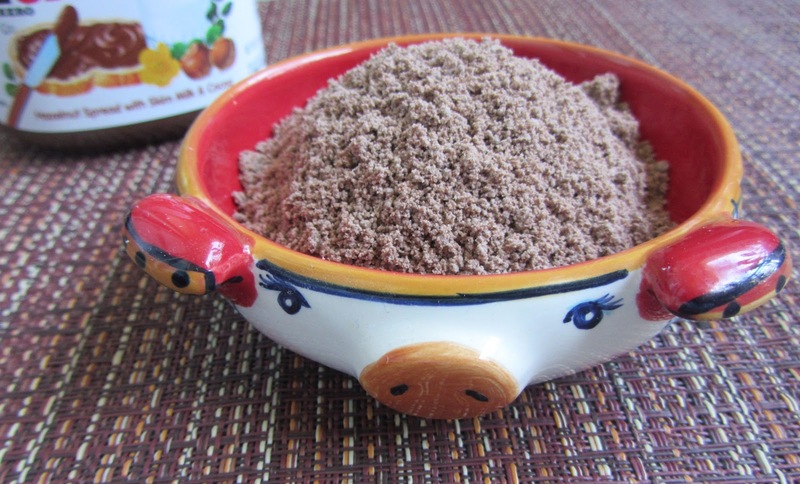 You wont find Nutella Powder at your grocery store. You can sprinkle the powder over a grilled banana, on a piece of toast, on top of ice cream or even make Nutella milk (amazing, trust me). A little goes a long way. 1/4 cup of Nutella powder will last quite some time. The process is simple. You first need Tapioca Maltodextrin which you can buy here for $9.99. I will never go through this entire batch. Grab a jar of Nutella, your food processor and an air tight container. Put into a food processor, pulse. Add more Maltodextrin powder if needed. Serving this powder at your next dinner party alongside dessert will make you the cool geeky foodie. For the record: One serving of Nutella, which is 2 tablespoons, has 200 calories, 11 grams of fat, 22 carbs, 29 grams of sugar and 11 grams of saturated fat. Ouch. Using Tapioca Maltodextrin will turn those 2 tablespoons of Nutella into powder, you now have 3/4 cup of powder which you can sprinkle on your toast - your 11 grans of fat has turned into .39 grams of fat for a 12oz portion. Monster Cookie Mix in a Jar – What Smells So Good? Please join on us on Twitter throughout the day during #SundaySupper on November 11. In the evening we will meet at 7pm EST for our weekly #SundaySupper live chat. We’d also love to feature your own posts for Gifts From the Kitchen on our #SundaySupper Pinterest board to share them with all of our followers, too. That's pretty neat how you made it into a powder. It sounds like it would make the Nutella go a lot farther then the tiny jar they sell it in. Absolutely! That powder will last me a very very long time. And with a fraction of the fat and calories! Nutella is so popular right now. Great choice, Megan! Well, that's completely ingenious! Wow! Thanks Nicole, I love it!! Wow! Cool! I wonder if you could do this with Biscoff? Yes, anything with a high fat content. Now I want Biscoff spread to play with! Don't forget about Cookie Butter! I will bring some Maltodextrin over one day and we can have a geeky science lab experimental project. That is so cool! You can make a lovely crumb topping with Nutella this way. You know, I never thought of that. HMM....In the kitchen I go! I've toyed with buying some maltodextrin before...usually after watching somebody on Chopped (or something similar) use it, but then I always seem to forget about it. This is such a cool thing. Would it stir into warm milk to make Nutella hot cocoa? Yes, it would work perfect Heather! I made nutella milk out of it, so I am sure warmed up would be just as delicious. Awesome recipe that I know my family will love. So glad you shared. Monkey girl is a nutella fiend. Thank you Veronica! Healthy Nutella is everyone's friend! Genius! I'm thinking of sprinkling it on ice cream and so much more. Super cool gift too. Ice Cream, Toast, Bananas, the list is endless! Great idea, Megan! Thanks for the detail information of calories contained in Nutella, I shall watch up:D! Nutella is amazing but it isn't amazing for your diet. I love this method of food science for that matter. You can still enjoy the naughty flavors but not have to stress out about your diet. Now that is so cool!! My daughter would love that on ice cream!! This is great timing...I actually had a dessert in Las Vegas last weekend that featured powdered Nutella on the side, and it was AMAZING! It sort of reconstitutes in your mouth. I asked the chef how it was made, but he wasn't sure since it was the pastry chef's department. Now I know...how fun! HA, who would have ever known that I would have solved the Nutella Powder mystery!! It's so easy to make and cheap. The powder is only $10 and it will last forever. This is really different and so interesting to make! What a great gift! Who doesn´t love nutella? Great idea! My girls love Nutella but I try not to buy too much because it is not very healthy. Now we can have just a little amount for the flavor and a lot less of the unhealthy! 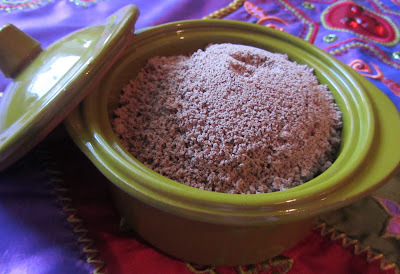 I grew up with Nutella - what a fantstic idea to turn it into powder! Love it! Thanks :) Nutella is one of my favorites. Thank you and I don't think I have ever met anyone who doesn't like Nutella! I absolutely love this idea! What a fun class. I can't wait to try this technique. Thanks for sharing. It was a fun class! You can even take truffle oil and turn it into powder. So many options. What a fabulous idea! I've never even heard of doing this - and wasn't familiar with maltodextrine at all! I'm so glad you posted this Gift idea - it's perfect!! Thank you!! It was a very good $10 purchase! Oh my goodness, now my inner-scientist wants to get me some maltodextrin! You can even use the powder in place of 1/3 of flour in baking recipes. Could you imagine Nutella cupcakes? That is really nifty! I will have to experiment with it some time! Thanks for sharing. You're welcome :) Glad you enjoyed it. I am seriously jealous of that class. I need to find something like that because I am very curious about the more science side of cooking. This recipe looks so cool, my husband was confused when I told him you make powdered nutella so I am going to show it to him tonight. Didn't mean to confuse the hubby :) Although I confused mine when I told him I was going to make Bacon powder. You take solidified bacon grease and you can make a powder out of it. How very cool!!!! What an excellent, unique gift!!! Thank you Liz!! It makes such a fun gift because it isn't something you can buy in the store. Oh and by the way... I want that pig bowl! I LOVE my Piggy bowls. I have a set of 3, got it from Macy's a few years ago. I have hidden pigs all over my house. No matter where you are standing, a pig is somewhere to be found. How cool are you. This is such a unique idea. You're a genius. Thanks so much Lyn! You can use the powder to make all sorts of naughty things, but they aren't bad for you. Bacon Powder for instance!! Or take Truffle powder for instance, you can extend the life of Truffle oil, getting more bang for your buck. I absolutely love Nutella - what a cool idea! I need to buy me some of that. Notice I said "that" so I didn't have the spell out that long word. I would love to sprinkle some nutella powder on some ice cream, or some cake, or some pancakes. HAHA, it took me a long time to be able to spell it without copying and pasting. I bet it would be excellent on pancakes! I saw the post title and wondered how the heck you turned Nutella into a powder! LOL I LOVE the stuff, but do try to keep moderation in check when it comes to the divine hazelnut goodness! Ummm....YOU WIN for coolest kitchen gift! So awesome.